Did the factory, or people who restore T's use anything to preserve the wood? My T was restored in 86/87 and i just noticed that the red oak they used was left unfinished. Its been in my driveway for the last two months till i can clear a spot out in my barn, but i swear it seems that being out in the open in this rainy spring, the wood is starting to buckle. I'm thinking of using a marine grade urethane to seal it, any thoughts? For long term, I've not been happy with urethane. It peels off in sheets after a while. I like the old time marine spar varnish and cut the first coat with 1/4 boiled linseed oil, 1/4 paint thinner, and 1/2 spar varnish. It seems to soak in good. After a few days of drying, I sand it lightly and follow it with full strength marine spar varnish. Thanks Verne, sounds like a good idea, cant imagine why it was left with nothing to protect it. A popular method used to be boiled linseed oil. But, all to often people would cut corners, then it would dry out after a while just like nothing was ever done to it. What I was taught was to apply it liberally once a day for a week, then once a week for a month, then once a month for a year, then annually forever! I did the red oak in my pickup bed daily for a week, then assembled it with the bed strips, etc. It looked good then, and I didn't want to have to clean it off all the metal trim, so, it's had no more in the last ten years. Even though it's always been stored inside, the wood now looks like nothing was ever done to it. The spar varnish from Lowes peeled/flaked off my hack in just a few years where ever the sun shined on it while parked in a barn. Use the good stuff from a marine supply store. Last I bought was about $40/qt, but it's worth it in the long run. I used that on my TT, and it's just now starting to look a little tired where the sun has hit parts of it for 15 years! Thank you Mike,..I appreciate all the input...You guys are the best. Its a new experience working on T'S and its a great new appreciation for a car i had no interest in initially until i bought my first one and am now totally hooked on them for life. My wife even loves the new addition, and that says a lot considering all the motors and trannys that somehow found their way into the living space of our house before we had a garage!..god loves a woman who loves a mechanic. I've always been happy with Woodlife Creocoat. Water based and dries to a flat black. Minwax Marine Spar Varnish will outlast just about anything. These wheels were treated with it about 1985. 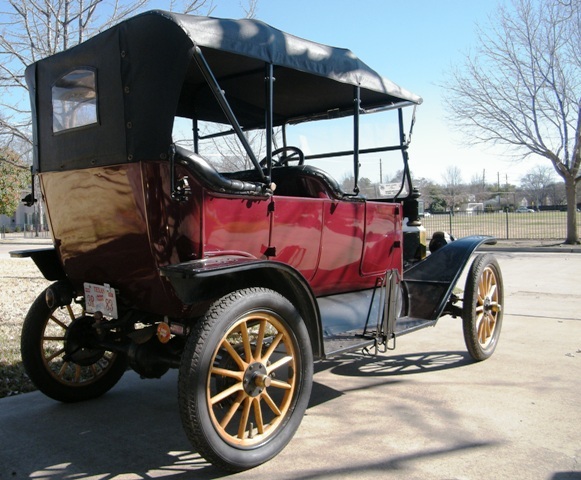 The wheels were new from Calimers at that time. Still look great after dozens of tours, many in the rain or the hot Texas sun. 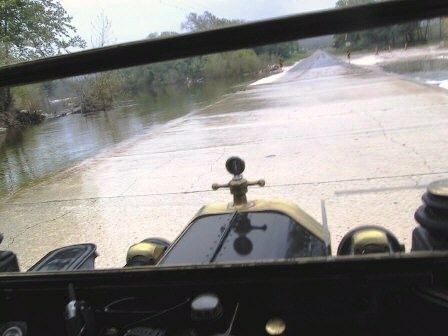 The same wheels were on the car in 2004 when I drove through this 20 inch deep 1/8 mile long stretch of low water bridge near Kerrville, Texas on the Texas T Party tour that year. It poured rain every day of that tour. I don't know what Ford used, if anything, on the floorboards but the floorboards on my '27 touring are original and still solid after sitting uncovered out in a field for many years. Any product that has linseed oil in it like Watco etc. is a fire waiting to happen with spontaneous combustion. One of the first things taught me in custom furniture manufacture was take a rag soaked with Watco wad it up and stick out in the sun. After a few minuets it will start smoldering. Over the years of disaster restoration I have seen painters coveralls with linseed oil start on fire in the back of a painters van. A friend moving into his new home had his 100k plane in the garage while his bride was finishing wood with Watco. The plane and home burned when the rags were left in a can coverd with news paper.